Its always recommended to deal with RERA Authorized Dubai Real Estate Agents or Real Estate Brokers while dealing in real estate market in Dubai. You will find the four options to search a RERA Licensed Real Estate Broker i.e. Office Number, Office Name, BRN, Broker Name. 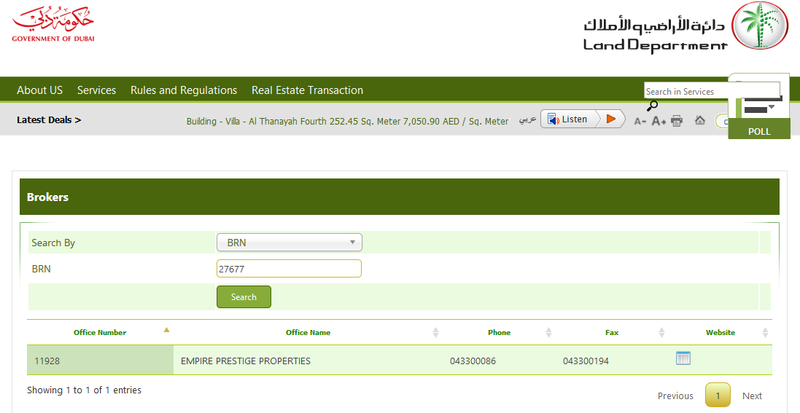 If you know the broker registration number (BRN) of Licensed Real Estate Agent, you can make search using BRN number also. 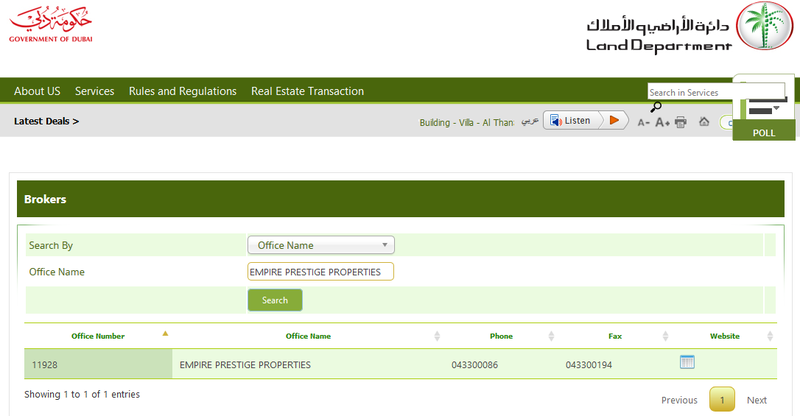 For example if you search 27677 as BRN number, you will find the Empire Prestige Properties as search results. 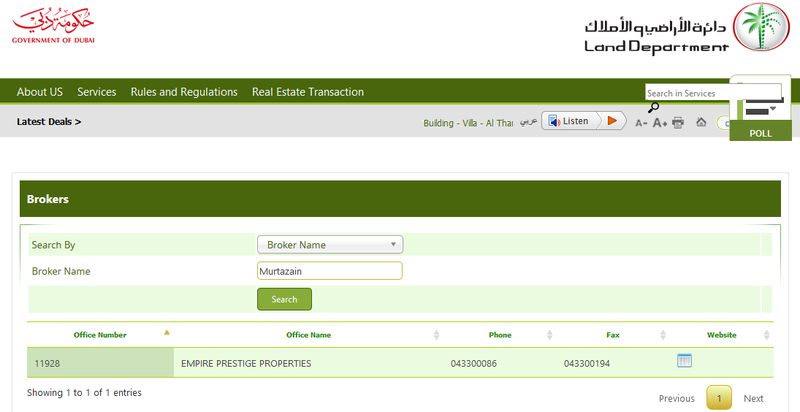 Those who wish to Buy Property in Dubai or take a Property for Rent in Dubai may visit to www.empirepropertiesdubai.com. We are licensed real estate agency in Dubai. Our website offers a wide range of options, including Apartments for sale in Dubai and Apartments for rent in Dubai. The property listing on various real estate portal looks like a dream property such as ideal location, has perfect and beautiful photos and is well below your financial budget. You send off an enquiry and get a speedy reaction from real estate agents: the landowner is right now abroad and can’t demonstrate to you the home. But if you can make online transfer some amount as a deposit as soon as possible, the property is yours. Most of the people who have tried to lease a property on the web, this situation may sound very natural. New technologies have made easier for property seekers to get all the desired information at their home, but the internet also made it easier for online fraudsters to target both buyers and tenants. Never agree to make any payments advance or sign an agreement without first inspecting the property. Seeing the property and meeting the Dubai Real Estate Agency are the most ideal approaches to ensure that the posting is genuine. One common trick is for fraudsters to duplicate a current (and genuine) posting of a property available for sale and repost it as a rental, with their own particular contact details. You should never be asked to provide your personal identification documents and bank account and other financial details to anyone over the Internet. Always remembers, never provide your credit, debit card details to anyone. One of the most important rules in real estate is that if a deal sounds too good to be true, it most likely is. Be aware about all online listing for attractive properties, which are exceptionally well or low priced for the particular zones. Scammers mostly used these very low price to tempt property seekers. Always focus on properties which are listed by well-known real estate agency in Dubai. Once you have detected any possible scam on a real estate search website, notify the platform immediately. Empire Prestige Properties is Real Estate Agency in Dubai, authorized by RERA with highly qualified and well experienced RERA authorized real estate agents. Our certified property agents is help guide you for each step whether you looking of Properties for sale or rent in Dubai.